(MP060). Watercolour signed and dated 99. Each print signed by the artist..
Standard print size: 8 x 6ins (20 x 15cms) approx. 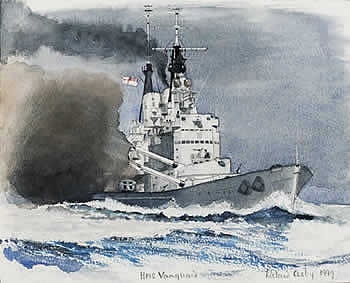 This watercolour depicts VANGUARD’s time with the Mediterranean Fleet in 1949 when she conducted a full calibre 15inch shoot in the Malta Exercise Areas on 16 May. Stationed close ahead of VANGUARD during the shoot was HMS CHILDERS and a Sea Otter was airborne to observe from the air. In the winter of 1947 VANGUARD had carried King George VI and his family to South Africa and it was hoped that the King would be fit enough a year later to embark on a similar tour to Australia and New Zealand. VANGUARD was accordingly readied for the voyage, the most obvious signs to the outside observer being the landing of the 40mm STAAG mounting from the roof of B turret, a pole topmast for the Royal Standard being fitted on the main in lieu of an air warning radar; and a Royal sunroom being built on the after superstructure forward of the director. The battleship worked up off Malta for these Royal Duties during the autumn of 1948 but the King was a sick man and this second tour in VANGUARD was never to take place. Laid down in 1941, VANGUARD was completed in April 1946 and was accepted into the fleet that August. With her extra freeboard forward and raked bow with massive flare she proved a marvellous seaboat and although her undoubted strengths were never to be tested in action she proved a fitting finale to the illustrious chapter in the Royal Navy’s history of the dreadnought battleship. VANGUARD, towed from Portsmouth to Faslane in Scotland for scrapping in August 1960, made sure she did not go quietly and on her way out of Portsmouth under tow she mananged to run aground in the entrance to the harbour. THUNDERER and WARSPITE  two other illustrious battleships to have slipped their executioners  would surely have approved!